We are often mapping in preparation for our next meeting, brainstorming, or presentation or generally keeping clarity on and managing one or more current projects. These business orientated maps can be large and content rich with very little need for colour and graphical content. Sometimes though there is a need to introduce a level of formatting to our maps. As well as adding branch shapes, pictures, backgrounds etc., the Branch Title itself can be formatted to help make your map memorable or emphasize particular bits of information. This can be utilised by those in business to highlight key points, or by those in Education to make the map more visually appealing for students. The Edit Branch dialog can be expanded (Select the Format button) to provide access to the formatting features. Once expanded all you need to do is select a word(s) and use the Font and Colour options in order to achieve mixed formatting within your branch title. You can also select "Insert Symbol" here which provides access to the symbols available on your PC. The branch format dialogue ensures it’s easy and quick to update all of these branch properties. Do you add formatting to your maps? What are the main reasons you do this? This is a different and interesting use of mind mapping – have you used MindGenius for mentoring or empowering your team in some way? Following on from May’s hints and tips, we've received requests for additional information on saving a map as a MS Word document. In response, we have put together a short video which outlines how to structure your map in order to create a properly formatted Word document and how to develop your content, as well as using the configuration options for your actual export to MS Word. MindGenius initially helps us get the content and the structure right for our Word document without worrying about formatting. Instead we can focus on our ideas and then think about the formatting at the appropriate time. Ultimately a typical Word document will be created from the structure and content of the map which is why you must consider the structure of your map before you export. Click here to access the video. Please pass onto colleagues who may find it of interest. MindGenius are pleased to announce that two new Online Training courses will be available from September 2010. The courses will be suitable for both individuals and teams who are new to MindGenius and who want to make sure that they have the fundamentals correct, as well as existing users who want to learn more of the more advanced capabilities of MindGenius. MindGenius can also offer onsite training for larger groups or train the trainer sessions, please contact us atinfo@mindgenius.com to book or for additional information. The University of Strathclyde has a site licence which offers access to MindGenius to all staff and students on University owned computers. Graham Murdoch is a lecturer in technical education at the University. He is responsible for teaching Post Graduate Diploma in Education (PGDE) students how to teach technical subjects in secondary schools. Graham has been using MindGenius for many years now and finds it assists him with both short and long-term planning, keeping on top of tasks, timetabling, and taking notes for meetings. For class, he uses MindGenius and mind mapping as part of his system of planning classroom lessons and to encourage his students to expand their knowledge. By using mind mapping or MindGenius for their planning, the students can note down all of the aspects of what needs to be covered. Instead of getting too focused or bogged down in one area, it is easy for them to ensure they have covered all of the relevant, appropriate areas. MindGenius also gives them the ability to visually link ideas and concepts to other ideas and concepts within the map, allowing them to build greater understanding on the relationship between different branches and the overall topic. 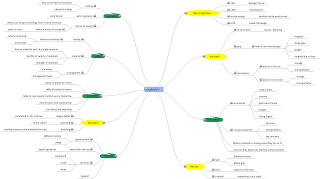 Graham often provides a mind map of a lesson that is being taught so that the class may expand on his version of the lesson mind map. The example below, the Principles of Effective Learning and Teaching, is a map that would accompany the notes students receive in their first lecture on the course. Graham has added links to areas that are connected and should be considered. The students use this map as guidance when they are on placements in schools. Graham also used MindGenius recently on an in service course he ran which outlined how to use the “Scalextric for schools” challenge for the new Scottish Curriculum for Excellence system. In this map, the green branches are classroom activities that the teachers could consider and expand on, whilst the yellow branches are either connected to the competition or are administrative points.